More than one million people visit Peninsula State Park every year but most days Eagle Terrace is quiet. Congratulate yourself for discovering a place less traveled! Eagle Terrace links events that span centuries. Was this jagged promontory a sacred place for Indian people? Who stood where you stand, watching both friend and foe paddle with strong, steady strokes? In 1953 (sic), a ragged group of Norwegian immigrants trudged across frozen Eagle Harbor, determined to establish a Moravian community. Look across the harbor to see the village of Ephraim today. Eagle Terrace is postcard perfect. But this bluff offered a livelihood as well. Eagle Bluff Stone Company (circa 1900) quarried the limestone rock. Descend the steep steps at Eagle trailhead to see for yourself. When Peninsula was established (1909) the quarry closed. The work site became a favorite picnic post. Today it offers sensational views of the sunrise, a rare vantage point in a park with mostly west-facing shore. The marker is located inside Peninsula State Park, at the Eagle Trail trailhead on northbound Eagle Terrace Road, just past the Peninsula State Park Golf Course and approximately one mile north of the intersection of Shore Road and Wisconsin Highway 42 / Water Street South, Fish Creek, Wisconsin 54212. When a man joined the Civilian Conservation Corps he got steady pay ($30 a month with $25 sent home to family) and three square meals a day. Both were rare commodities in the Great Depression of the 1930s. Pictured here is Camp Peninsula, a CCC camp once located behind present day Gibraltar School. 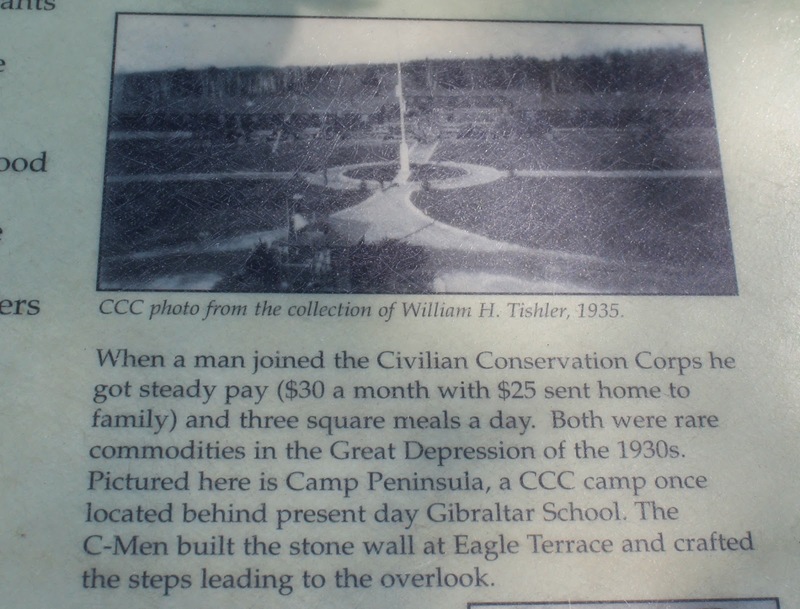 The C-Men built the stone wall at Eagle Terrace and crafted the steps leading to the overlook. Reverand Andrew Iverson led a group of Moravians to Door County in 1853. The Beech-Maple Forest State Natural Area, designated in 1952, features land that changes from bluff to shore. Forested terraces drop a total of 150 feet, past limestone outcrops lush with ferns. The 80-acre area lies west and south of Eagle Terrace. The marker is just to the right of this sign.